Scott Pruitt is the head of the Environmental Protection Agency and he has a loving relationship with carbon dioxide and methane gas, though he gives the cold shoulder to believing in global warming. In mid-June, the EPA announced they would be staying regulatory actions on oil and gas regulations for two years. NPR reports that an appeals court in Washington D.C. blocked the EPA’s attempts at delaying Obama-era methane regulations on Monday, ruling that the agency is allowed to re-write the rules via the standard procedures for changing policy, but suspending them for years was “tantamount to amending or revoking a rule.” Do the work, you lazy earth destroyers. 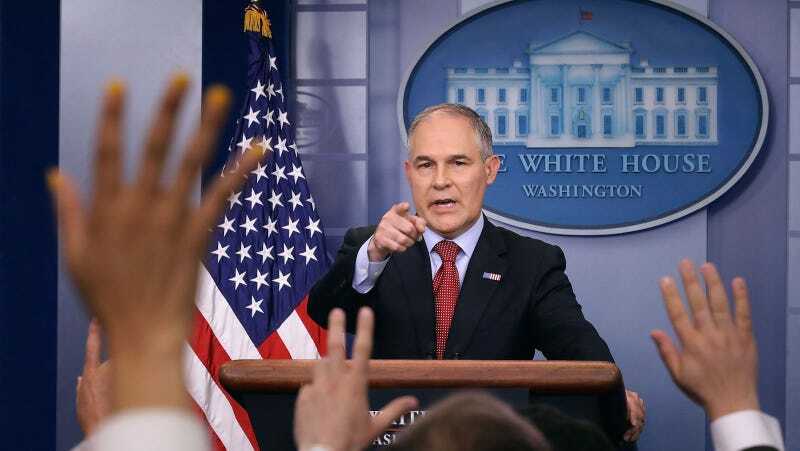 According to the Environmental Defense Fund, the EPA’s attempt to delay clean air safeguards began after Pruitt met with the American Petroleum Institute at a Trump Hotel in D.C.. The meeting was disclosed through a FOIA request. He likes to do stuff like that. The EPA argued in court that the stay was necessary as oil and gas industry officials hadn’t been given the opportunity to comment on the regulations before they were enacted—though in fact they had, in writing. “Even a brief scan of the record demonstrates the inaccuracy of EPA’s statements,” the judges wrote. “The administrator believes that we will be able to recruit the best in the fields which study climate and will organize a specific process in which these individuals ... provide back-and-forth critique of specific new reports on climate science,” the source said. Energy Secretary Rick Perry is also on board, though he’s already pretty sure he knows what’s causing climate change.